Meet your neighbor Ashley Ferguson of La Harpe. She was born on December 9, 1988 in St. Louis, Missouri, the daughter of Michael and Sherry Lotz of Blandinsville. When Ashley was in the first grade her family moved to Blandinsville and lived right down the road from her Grandma and Grandpa Lotz. She graduated from West Prairie High School in 2007 and from Carl Sandberg College in 2009. She is currently working on her RN/BSN. Her goal is to be a nurse practitioner. Ashley married Tyler Ferguson on January 25, 2013 at the Lomax Christian Church with Pastor Peggy officiating. Ashley and Tyler have two children, Aden Reed and Rosaleigh Ferguson. Aden is 5 and attends preschool in La Harpe. Rosaleigh was born on August 16, 2012. 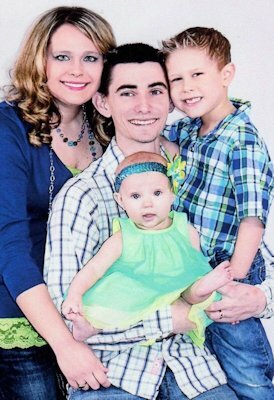 Husband Tyler was born on January 7, 1986 at McDonough District Hospital in Macomb, the son of Angela Martin and Tim Ferguson. Tyler has one sister and one brother. His sister, also named Ashley, is 26 years old and has one son, Keaton McConnell who is 4. Ashley is the assistant manager at Dollar General in La Harpe. Tyler's brother, Caleb Ferguson is 22 years old. His grandparents are Frank and Donna Martin formerly of La Harpe, now of Canton. He is the grandson of Nancy Cook. Ashley's father, Michael owns his own business, L&L Masonary & Construction and mom Sherry, is an MA at Family Practice McDonough District Hospital. Sherry was the first to attend and graduate college in her family and she graduated valedictorian of her class. Ashley has one older brother, Andrew. He and his wife, Amanda, live in Beardstown with their 5 year old daughter, Rebecca. Andrew has worked at Cargill since he graduated from high school and Amanda has her own massage parlor. She is the granddaughter of Harry Herbert and Elizabeth "Rose" Lotz of Blandinsville. Rose was a stay at home mom of 9 children and Harry was a farmer. She is the granddaughter of JoAnn Birchfield, a stay at home mom and Basil Duke, a military man, of Alabama. When she was younger Ashley loved going to Alabama and spending weeks at a time with her mother's family. She would also go and stay with her Aunt Trina in St. Louis, MO during the summer and go to Six Flags. Ashley loves to spend time with her family. She also loves to do crafts, cook and create fun memories with her family and friends.